Wherein I hold your hand through this past weekend’s Tropics games and link to all the goals because I’m a cool guy like that. Let’s Get Tropical! 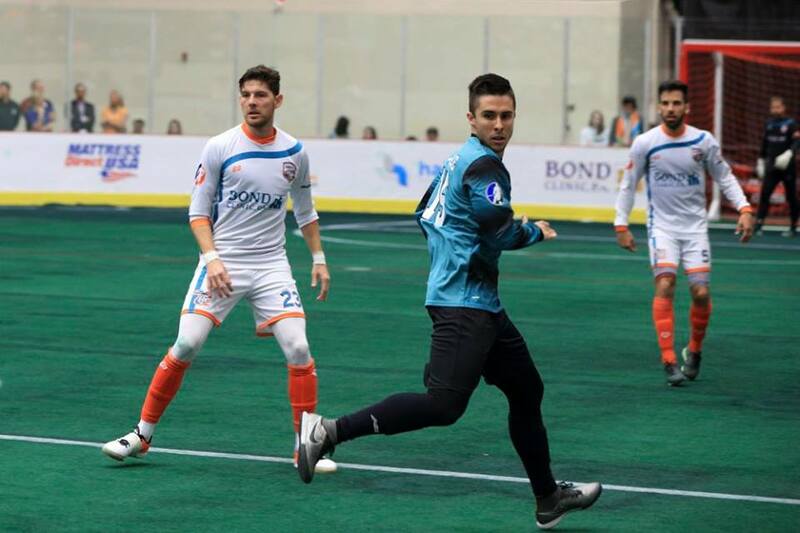 Central Florida’s MASL squad improved their record to 6-7 this past weekend and control their destiny going into the playoff race. Florida Tropics SC scored a hard-fought 4-3 win over St. Louis on Friday night, then put the cherry on top on Sunday (see what i did there?) with their best offensive performance ever, sweeping the Ambush with a 9-4 victory. The Trops are now 3-0 in their 7 game home stand and play 6 of their remaining 7 against divisional foes Harrisburg Heat and the Syracuse Silver Knights. 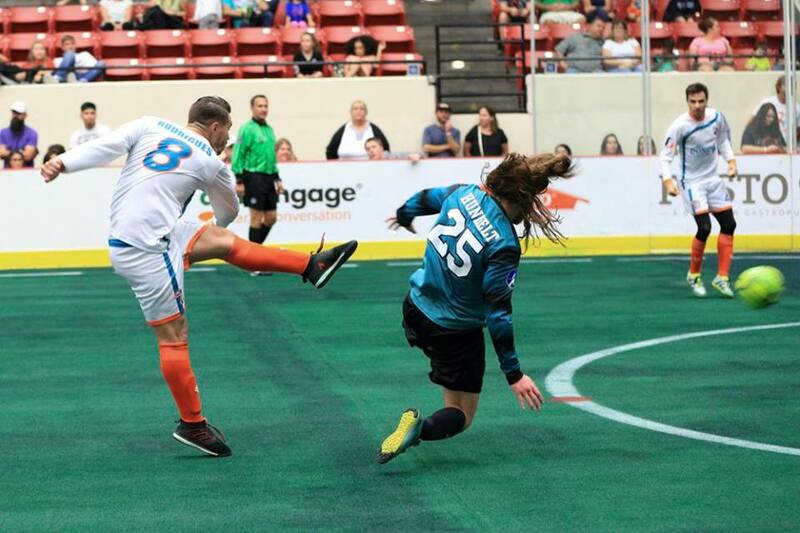 The Orange & Teal came into the weekend with momentum after last week’s home win over Dallas and were looking for revenge after the Ambush came from behind to win in Missouri earlier in the season. The season series between St. Louis and the expansion Tropics was rife with storylines as FTSC owner Andrew Haines had sold the Ambush organization to local owners follwing the 2015-16 season and turned his focus to his expansion squad. Haines took the core of Ambush team with him to Polk County, bringing in GK Piotr Sliwa, MF Anthony Arico (of R2D4 fame), and FW Freddy Moojen. Tropics SC defenders JP Reyes (23) & Lucas Teixeira (5) guard against St. Louis’ Victor France (15). On Friday night, approximately 3,500 fans were treated to a highly competitive 4-3 Tropics home win, their second in a row. The scoreboard was first lit in this low-scoring affair by an absolutely electric buzzer-beating bicycle kick by Tropics forward Victor Parreiras at the very end of the first quarter. In the second quarter, defender & Rowdies 2 alum Rapha Nascimento doubled the Trops’ lead to 2-0 by slamming home a Wallascora goal off the well-angled wall pass from Captain/Asst. Coach Freddy Moojen. In the second half, the two teams traded goals but Florida’s advantage was too much for the visitors to overcome. Victor Parreiras beat the buzzer again at the close of the 3rd quarter – more conventionally – with a set piece rocket. 39-year-old recent un-retiree Robbie Aristodemo scored the Tropics last of the night in the 4th, cleaning up a mess created by Tropics forward Jowayne Laidley in front of the St. Louis goal. Florida Tropics SC midfielder Marco Rodriguez scores his third of the night. On Sunday night, a crowd of 2.7-3k fans were on hand at The Lakeland Center to witness the expansion Tropics’ most dominant win ever. Though the Ambush scored first early in the match, Freddy Moojen sparked the Florida attack by slotting home a cross-goal ground pass from Venezuelan MF Victor Rojas. From then on, it was almost all Tropics. In the second quarter, the Tropics matched their franchise record for goals in a quarter with 5 (both times against St. Louis). Toronto FC Academy product Marco Rodriguez broke the 1-1 tie with a vicious left-footer from the red line. St. Louis then answered with another goal, before Victor Rojas put Florida ahead for good. Rojas’ goal came off a well-orchestrated free kick play involving himself, MF Lucas Teixeira and Moojen, who earned the assist. Rodriguez’s second of the night came less than a minute after that and was a true showcase goal. The Canadian midfielder stormed off the bench to dispossess a St. Louis player before turning an Ambush defender inside-out and blasting a powerful left-footed shot that smacked GK Casey Clark’s right hand on the way in. The Tropics fifth goal also came off a set piece, though a pre-drawn play wasn’t needed. Brazilian midfielder Lucas Teixeira saw an opportunity in the disorganized St. Louis defense and cleanly slotted a shot bottom-left. Rojas completed his brace in the second, putting his own rebound in after Anthony Arico carried the ball up swiftly from defense. After playing conservatively on Friday, the Tropics were able to employ a full-field press for most of Sunday. The aggressive riding paid off clearly on Florida’s 7th of the night. The offensive pair of Jowayne Laidley and ex-Loon Daniel Mendes worked the St. Louis defenders and forced a turnover. Mendes (who last played outdoors with Minnesota United in the NASL) found Anthony Arico (who last played outdoors with Rowdies 2 in the NPSL) who hit a red-line shot that was initially stopped but then rolled under and past the STL goaltender. The tenacious press paid off again against the beleaguered Missourians late in the third. Moojen and Parreiras pressed hard at the midline and were joined by DF Rapha Nascimento who sent forward a ground pass that Moojen was able to one-time into the back of the net for his second goal on the night. The final goal of the night saw the young Canadian Marco Rodriguez complete his hat trick (Florida’s third ever) by again turning his defender around and firing an unstoppable left-footer. Victor Rojas, Lucas Teixeira, Lucas Montelares, and JP Reyes sign autographs for fans. Y’all will largely get a reprieve from me talking about the Tropics as they take a 2 week break before returning to action. 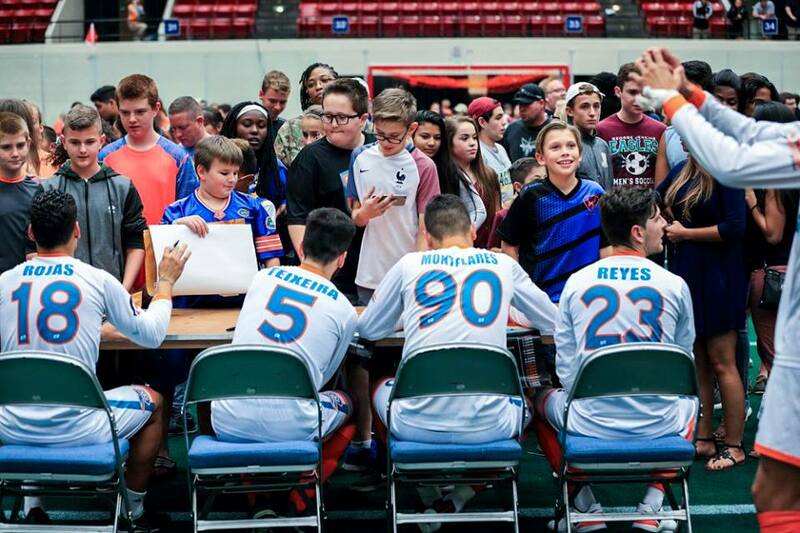 Florida Tropics SC will retake the carpet at The Lakeland Center on Friday January 27th at 7:35pm against the Central Division’s Kansas City Comets. This will be the rubber match for the two teams. The Comets won 6-4 in Lakeland on December 17th, but the Tropics took the second game 8-7 in Independence, Missouri. The game will, of course, be livestreamed on the MASLtv YouTube channel. Tropics head coach Clay Robets set a goal for the team to win all 7 of their games in this, their longest homestand of the year. Right now, the expansion Tropics are 3-0 in their past three and control their destiny heading into the playoffs. On Monday, January 16th, the Tropics added yet another veteran to their ranks in the form of arena soccer stalwart GK Marcel Feenstra. 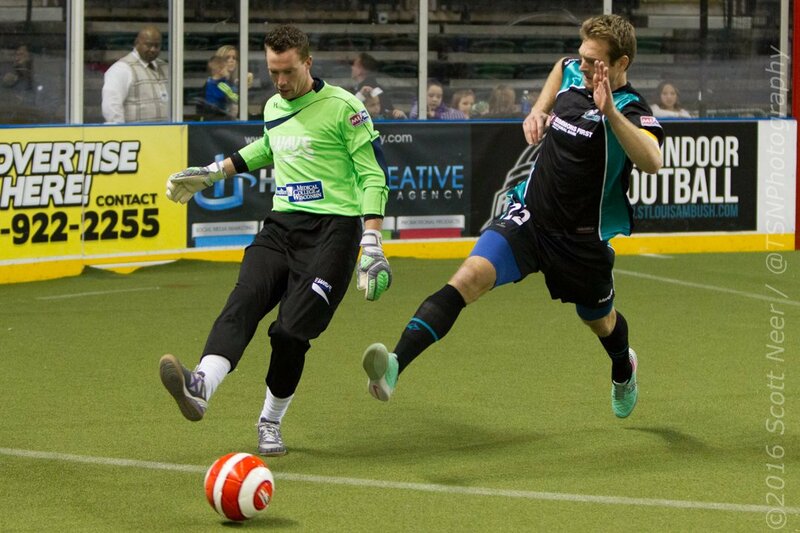 Beginning in 2007-08, the Dutchman played nine seasons indoors, all for the Milwaukee Wave. Feenstra led Milwaukee to back-to-back league titles in 2010-11 (where he earned Finals MVP honors) & 2011-12. Feenstra will have two weeks to train with his new team before becoming the second goalie to ever start a game for Florida. Tropics GK Piotr Sliwa will have to sit out the team’s January 27th tilt with Kansas City due to yellow card accumulation. Tom De Pinto is the capo of the official Florida Tropics supporter's group, the Swan City Syndicate. He is also an active drinker in Ralph's Mob and a Brandon Cup champion. Great two games. The team is really coming together, it’s very exciting to watch their development, and the veteran acquisitions have only solidified the lineup thus far.